But this one could be subtitled "I grocery shop on Wednesday nights, so Wednesday lunches are whatever is left in the fridge!" F&B go to our church's kids program on Wednesday nights. This means I have a good two hours to simply go shopping without anyone helping me. So if possible, I hold out till Wednesday nights and go grocery shopping alone. In the process, the last Wednesday bentos typically have the remnants of the week's food sitting in them. Ben has egg salad pockets, made with mini pita breads. He & Faith prefer a simple egg salad of just eggs & mayo, fine with me, we probably don't have other things to use. ;o) It's topped with a little candy pumpkin that my mom sent because she thought they had great bento potential! To the right, we have cantaloupe with a ghost pick and strawberries with a pumpkin pick, then to the bottom left are some kind of teddy graham cracker/cookies. I have no idea how they ended up in my pantry, but we happily used them so I could fill the last compartment. We now have food again, so more interesting bentos to come. And, if you're in the Halloween mood, F&B and I made awesome Halloween ghost handprints. Seeing them now makes me wish I had made them yearly. Wouldn't they be cute all lined up with bigger and bigger ghosts? I wish we have that Pumpkin candy here ... so sweet and cute! Well, the fruit was a bit of a cheat. Shaun had gotten fresh strawberries earlier this week and I bought an extra cantaloupe last week that I didn't cut up right away so it lasted longer. 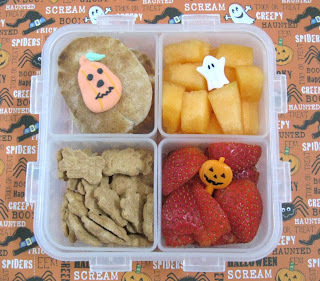 Cute Halloween theme bento. Love the small Halloween touch in each of the sections of the box! And the creative ghosts hand print as well! You are so inspiring. Thanks for sharing and thanks for being such a wonderful contributor to Momtrends.